Some poets take time to be discovered by individual readers. What is the fame of today might not turn into interest for certain readers until a lifetime down the road. The name Wislawa Szymborska is synonymous with excellent poetry, though I’ve never had a taste for her writing until recently. It’s not that I ever accused her poems of lacking talent, it’s just a right poet – wrong time scenario. Luckily, the time has come when our consciousnesses have collided. Hopefully, after this post, you’ll collide with it as well or keep a bookmark as a reminder. Polish poetry critic Zbigniew Bienkowski called Szymborska’s poetry “open to a world of thought” and “anti-intellectual,” adding that the poet herself “…has the courage and the luck to indulge in homely, amateur thought.” This is not an insult, but it is also far cry from carrying the proper connotation. I believe that the plainness of her language (at least judging by the English translation) and seemingly natural flow of thought is what led to his assessment. 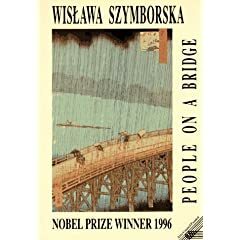 Almost every poem in “People on a Bridge,” however, beams as an example of what poets do when they set their minds to translating inspiration into words, ideas into designs, blueprints into poems.